Create super spectacular d�cor with our bendable and wavy top beaded curtains from ShopWildThings and our satin rod pocket curtains are the answer for curves, corners or any odd shaped area you need to beautify! Scrunch them up or stretch them out! Attach them to curved walls or structures, wrap them around columns or outdoor pavilion fixtures AND it's so easy to place and secure these amazing beaded curtains with bendable top rods! For areas that need some pizazz, our wavy top curtains make an awesome focal point! We can CUSTOMIZE just about any of our Beaded Curtains for you with a Bendable Top Rod! We can even put the beads on fabric, add grommets and more! Just let us know what you're looking for, and we will make it happen with a Custom Order . Want double-the-strands? No Problem! We love custom orders and do them in-house! Just give us a call at 928.855.6075. Leading event planners and interior designers rely on our unmatched inventory. We can also custom fabricate beaded curtains with bendable metal tops. You can order these bead curtains with fabric mesh tops. Our bendable-top Wave curtains were featured on the hit television show Dancing with the Stars. Each bend-the-top curtain is 3 feet wide and has 34 strands of gorgeous beads. Our ready-made curtains range in length from 6 to 9 feet. Or, special-order the length you want. 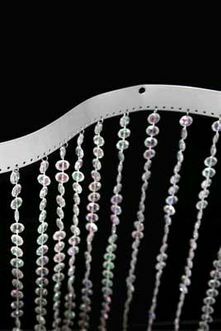 Our expert craftsmen will create your custom beaded curtains fast in our U.S. facilities.